Hugh Glass (di Caprio) fighting off attackers aboard a Mackinaw riverboat. Five of the greatest films of the post-1950 era - John Huston's The African Queen, Werner Herzog's Aguirre Wrath of God and Fitzcarraldo, along with FRancis Coppola's Apocalypse Now and John Boorman's Deliverance - although very different in tone, subject-matter and location, share a crucial characteristic. They all involve a hazardous river journey into unknown or dangerous territory, in which the unity, courage and resolve of the participants is severely tested - a great basis for a good movie. It's a potent cinematic combination, and The Revenant is the most recent movie to use it. In this case the river(s) are the forbiddingly cold tributaries of the lonely upper reaches of the Missouri. They were the waterways used for centuries by that area's Indian tribes. Now they were shared, usually unwillingly, with the region's Indian tribes' new trading rivals: European fur traders / mountain-men such as Hugh Glass. This map shows how the fur trade of the late 18th -early 19th centuries used the various tributaries of the Missouri. 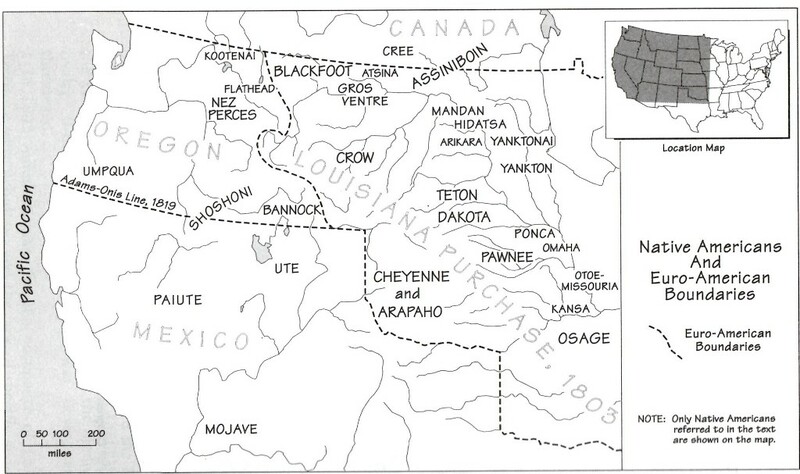 The maps reveal the enormous scope and complexity of the river system in which the traders and mountain-men operated. Note the location of forts along key tributaries of the Missouri River. There was also an abundance of tribes both sharing and disputing trading and hunting claims amongst themselves and also with the interloping European trappers and traders. The map above-right also shows the importance of forts (many of which were not military installations) in providing vital communication links and the prospect of a safe haven in wild country. In such a wild, mountainous area rivers were the chief means of transport and communication. 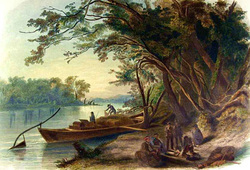 A variety of devices were used by Indians and their European trading and trapping rivals to travel the extensive and perilous river network. The Revenant follows movies such as The Big Sky in depicting several of these vessels and their crews working in hazardous conditions, a fact which adds excitement and authenticity. One of the great feautes of The Big Sky is the steady, unrushed tempo of its story set against great natural backdrops: a couple of men use a keelboat to travel 2000 miles into inknown territory in order to trade with the Blackfoot Indians. Fort Union (map above right) had a chantier [boat-yard] that made keel-boats for the region as well as providing supplies and repairs etc. Scene from Howard Hawks' "The Big Sky" - a keel-boat river boat) transported across land. 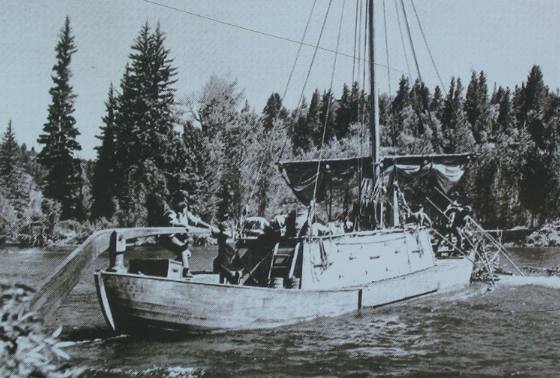 The keel-boat used in "The Big Sky". Keel-boat on upper reaches of Missouri River. This "Revenants" image captures the dangers of river transport in the wild northwest. Note the keelboat. 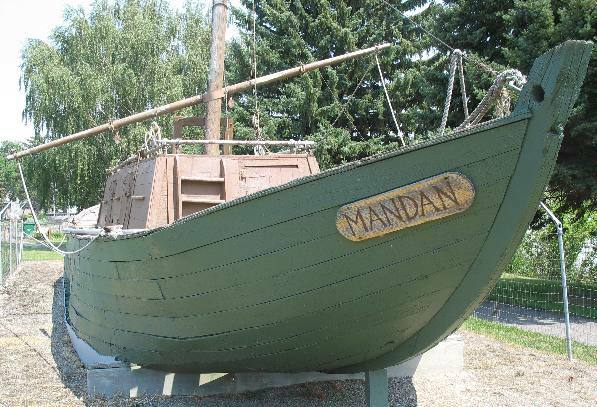 The Revanant features a variety of keel-boat, a cumbersome but capacious vessel. Other varieties of river transport apart from keel-boats were also used in the northern reaches of the Missouri. These included the Mackinaw and the bull-boat. 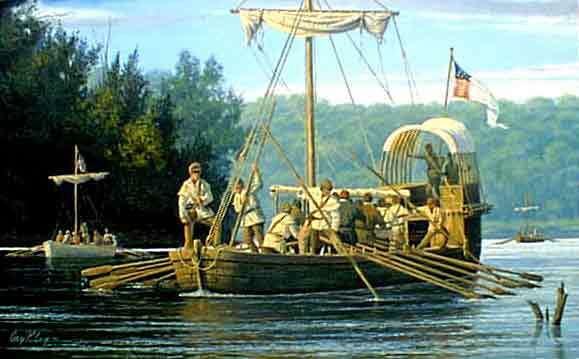 Lewis & Clark expedition's keelboat. Small craft, originally made by American Indians and soon copied by frontiersmen. 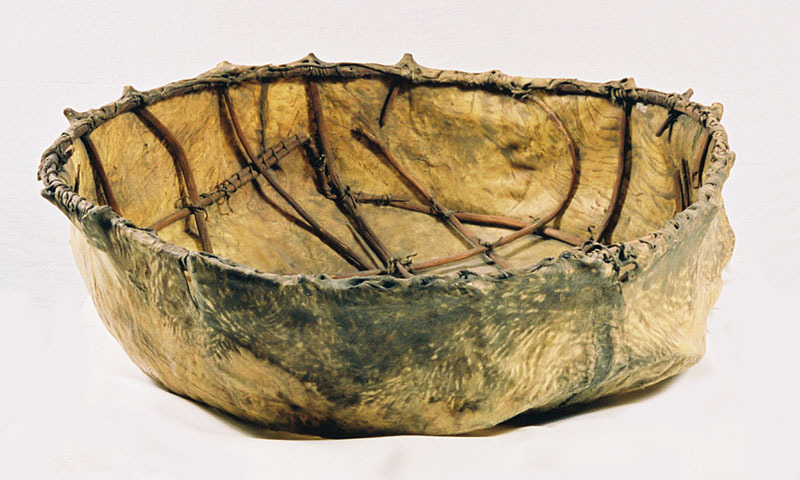 It was made by covering a skeletal wooden willow frame covered with a fresh buffalo hide, fur side out and left to dry. The tail was left on, and used for pulling the bull-boat. Propelled by cottonwood oars with slots , often by Indian women. It was used for travel, carrying some pelts etc, and fishing. Weighed only thirty pounds but could carry up to half a ton. A Macinaw was about 50 feet long and nine feet wide. ​It required a steersman and a crew of five. Varied in size, but largest could travel 100 miles a day (downstream only) carrying a cargo of 300 packs of fur, each weighing 100 pounds. Some Macinaws could be fitted out with sails. Widely used for decades on the rivers of the North American wilderness. Keelboats differed in size and shape. Unlike Macinaws, they could travel upstream as well as downstream. They had a deck cabin - sometimes quite large - and were about 60 feet long and ten feet wide. Fur trade keelboats carried a pilot and a large crew (20 - 40) who had the backbreaking jobs of rowing, poling or pulling the boat along (using a cordelle, a very long rope). Some could carry up to 40 tons of furs and other freight. Sequence with riverboat from "The Big Sky"